Mikhail Denisovitch Arkadin was a nuclear technician at the Chernobyl nuclear power plant in Russia (you can probably guess where this is going). When not working, Mikhail was a family man. His wife’s name was Nina, his daughters Irena and Sofia. Unfortunately Mikhail was caught in the Chernobyl disaster; the only reason for his survival was the activation of Mikhail’s metagene. Mikhail spent several months in a catatonic state. When he awoke, the majority of his skin had burned off and he continued to burn uncontrollably, and somehow he continued to survive. Mikhail was then recruited by Major Zastrow, leader of the Red Shadows, and given the codename Pozhar (translates to “destructive fire”). Mikhail was fitted with a Rocket Red suit of armor and began testing his new powers. Mikhail discovered that he’d gained the ability to: burn through just about any substance, create geysers of lava, project blasts of fire, and reduce any matter on hand into consumable energy for himself. Through a series of circumstances (which you should really read for yourself: Fury of Firestorm #62-#64, Firestorm the Nuclear Man Annual #5, and Firestorm the Nuclear Man #65), Mikhail found himself part of the Firestorm matrix. No longer was the Nuclear Man the fusion of teenager Ronnie Raymond and scientist Professor Martin Stein. After Firestorm The Nuclear Man Annual #5 (Oct 1987), Firestorm was composed of teenager Ronnie Raymond and Russian nuclear technician Mikhail Arkadin. Whenever they were merged as Firestorm, both Raymond and Arkadin were trapped inside the fused body unable to affect its actions. The being in control of the Firestorm form was independent from Raymond and Arkadin and acted very detached. The new Firestorm had his own personality and desires, yet he seemed to lack any life experience and had no memories. He was a blank slate. Many months later it was revealed the blank slate entity controlling Firestorm was actually Professor Stein’s amnesiac subconscious. For more on the “Blank Slate” Firestorm, please click here. When not Firestorm, Mikhail was returned to his Russian home. His body had returned to normal and his Pozhar powers were only present when he was part of Firestorm. Mikhail’s regular life began to settle down and he secured a position teaching nuclear physics at a University. The Firestorm comic during this era spent much of it’s time splitting the action between the United States and Russia. Some of the Russian subplots included: the Cold War super-soldier Stalnoivolk, Zastrow’s continued manipulation, the alien Zuggernaut, Mikhail’s brothers, his niece Serafina and the teen super-team Soyuz, Mikhail’s rocky relationship with his wife Nina, the blinding of his daughter Sofia, and the mysterious Rasputin. The “Blank Slate” Firestorm’s existence lasted nearly two years. Neither Ronnie nor Mikhail were part of the series during the Elemental Firestorm era; they had both been absorbed into the Elemental entity. Mikhail briefly reappeared in Firestorm #100, reunited with his wife and children. Years later, Mikhail regained his Pozhar powers after being exposed to plutonium released by a dirty bomb. Mikhail resumed being a superhero, and even teamed up with Firestorm again during the Jason Rusch/Professor Stein era. We’ll talk more about Mikhail’s recent exploits later this week! Writer John Ostrander took a big gamble changing Firestorm as dramatically as he did back in 1987. I believe it was a gamble that really paid off! 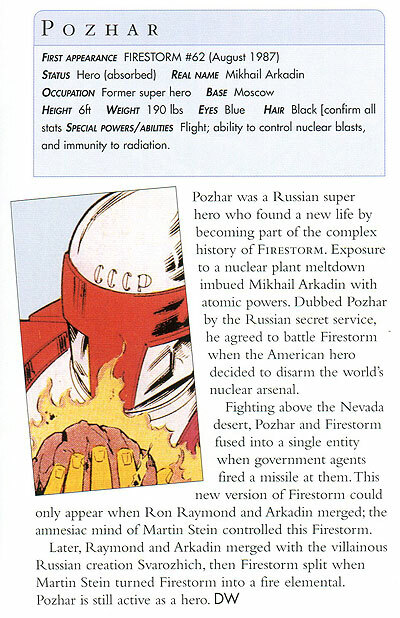 Changing Firestorm to be half-American and half-Russian was a brilliant move, especially during the late 1980s. With the United States and the Soviet Union the major nuclear powers at the time, it made perfect sense. These changes brought lots of interesting new situations, settings, and characters. Best of all, we got the incredibly likeable Mikhail Arkadin! Mikhail will be remembered fondly as an integral part of the Firestorm mythos. Below you’ll find Pozhar’s entry from DK’s DC Comics Encyclopedia, Updated and Expanded Edition (September 2008). For fun, notice the accidentally-included notes after “Hair”. Next up is a decent write-up about Pozhar from eNotes.com. I believe this content was originally posted to Wikipedia, but was later eliminated as they consolidated Firestorm-related pages. Mikhail Denisovitch Arkadin was a nuclear technician at the Chernobyl nuclear power generating plant in Russia. After an accident in reactor #4 caused an out-of-control fire, his metagene was activated. Major Zastrow, leader of the Red Shadows, arrived at the scene of the accident and recruited Mikhail. In 1986 after Gerry Conway’s departure, John Ostrander took over the writing chores on Fury of Firestorm. His first major story arc pitted Firestorm against the world, as the hero (acting on a suggestion from a terminally ill Professor Stein) demanded the U.S. and the Soviet Union destroy all of their nuclear weapons. After tussles with the Justice League and most of his enemies, Firestorm faced off against Pozhar in the Nevada desert, where both had an atomic bomb dropped on them. When the smoke cleared, a new Firestorm was created who was made up of Raymond and Arkadin, but controlled by the disembodied amnesiac mind of Professor Stein. The stories featuring this version of the hero were highly political, with a good deal of action taking place in Mikhail Gorbachev’s Moscow. The Raymond/Arkadin Firestorm proved to be a transitional phase, as in 1989, Ostrander fundamentally changed the character of Firestorm by revealing that Firestorm was a “Fire Elemental”. Taking his cue from Alan Moore’s Swamp Thing (a plant elemental), Firestorm now became something of an environmental crusader, formed from Raymond, Arkadin, and a Soviet clone of the previous Firestorm, but with a new mind. Professor Stein, no longer part of the composite at all, and cured of his cancer, continued to play a role as adviser. Eventually, it was revealed that Stein had originally been intended to be the fire elemental solely by himself: the inclusion of others in the Firestorm entity, such as Raymond and Arkadin had always been by accident. In order to defeat the monster Brimstone, who was threatening to destroy the Sun, Firestorm split into his three parts and allowed Stein to transform into Firestorm. Arkadin then presumably returned to his homeland, depowered. Mikhail’s niece is Serafina Arkadin (Firebird); she is the leader of Soyuz, the Russian equivalent of the Teen Titans. Mikhail Denisovitch Arkadin returned as Pozhar in Firestorm the Nuclear Man v3 #27, September 2006. In issue #29 Mikhail reveals that he regained his powers after being exposed to the plutonium released by a dirty bomb. Pozhar can alter the density of his own body, project bolts of nuclear energy, fly at great speed, and absorb radiation in to his body harmlessly. According to Firestorm v3 #29, Pozhar is an energy transformer, not an energy battery like Firestorm or Firehawk, so he is incapable of retaining large stores of energy and uses up whatever he absorbs. Pozhar usually converts matter into energy to recharge himself, but can also absorb extant radiation. Notes: In Russian the word “pozhar” means destructive fire. That’s it for today! Come back tomorrow as we continue our look at Pozhar! Posted in: Firestorm #02: Blank Slate (Ron/Mikhail/Stein), Firestorm comic vol. II, John Ostrander, Mikhail Arkadin/Pozhar. More like POSEUR week, am I right??? I demand more pictures of skulls on fire. @liquidcross – If that’s what you want, be sure to come back tomorrow! I would have include some today, but I gotta space these things out. They gotta last a whole week. Great information. I have the potentially dubious (given the backlash of your podcast of prior events) distinction of offering up the idea of touching on previous stories you and Rob liked, but this is right up my alley. Great post Shag! I had read about Pohzar as “the Russian Firestorm” but never took the time to actually read what his deal was. This explains it very succinctly. He reminds me of Dmitri Bhukharin — the fifth Crimson Dynamo — in that he was the Soviet equivalent of the hero who eventually outlasted the Cold War and become something of an ally. Also, neither seemed all that interested in the Party despite being Communists (which can be contrasted with, say, Titanium Man, who was a staunch Communist).